Bruxism is the medical term for grinding or clenching teeth. When you find yourself in the morning experiencing painful jaws or a headache, you may be suffering from this condition. 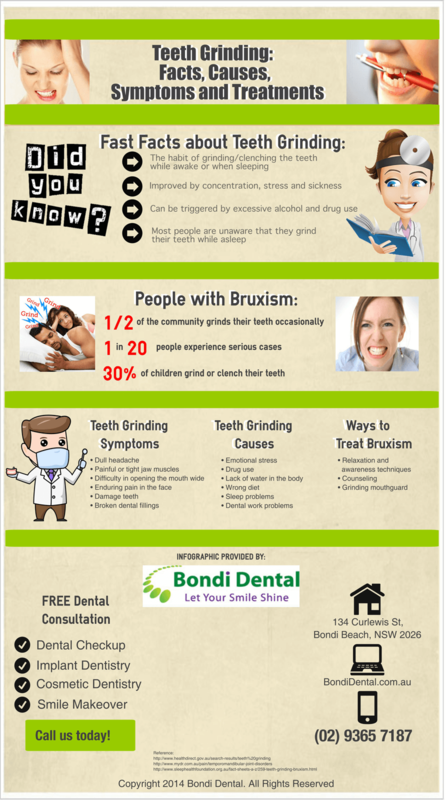 Bruxism can make your teeth painful or loose. In some cases, parts of your teeth can actually ground away. Sooner or later, bruxism can devastate the neighboring bone and gum tissue. Treatments for bruxism vary on the causes of the problem. Your dentist can help you determine the probable cause of your bruxism through comprehensive examination of teeth. According to the amount of tooth damage and its potential source, your dentist may recommend wearing a device while sleeping, looking for the best ways to relax, and decreasing the “high spots” of some teeth to level your bite. If you know that you have symptoms of bruxism, call your physician or dentist. Seeking for a professional help right away will help you deal with the condition effectively. Here at Bondi Dental, we have top-notch dental tools and equipment suited for the medication of bruxism and other related problems. What Increases Your Risk for Teeth Grinding?